You're not alone if you feel as if you're getting sick after flying: Around 20 percent of people on commercial flights develop symptoms of the common cold within one week of travel. Researchers are finally starting to gather and publish more data about the health risks associated with airplane travel. With literally billions of people traveling by air every year now, researchers are finally starting to gather and publish more data about the health risks associated with airplane travel. In terms of the common cold, it is now well-accepted that acute respiratory infections are frequently experienced after air travel. So it’s no surprise when we find ourselves getting sick after flying. Studies have found a high prevalence and wide array of respiratory viruses in people who have recently traveled. Up to 20 percent of passengers may develop respiratory infections within one week after air travel and that flight attendants have significantly more respiratory infections than those who do not frequently fly. Protect yourself from the aches, pains, and discomfort of colds and the flu. 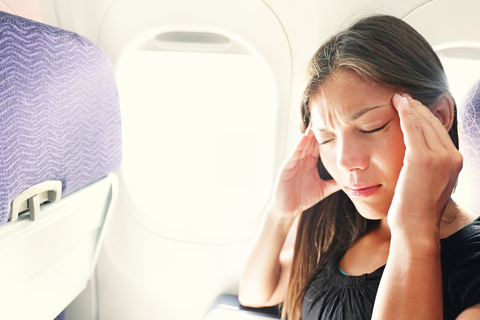 So why does flying on a plane increase our susceptibility to getting sick? Spread of exhaled infected droplets. Airline cabins have lots of people in a crowded space who are there for long “exposure times,” so the risk of infection via airborne transmission could be high—especially if one or more passengers are infected with an airborne infectious disease. Droplets exhaled by an infected passenger may contain infectious agents such influenza. In fact, droplets have been shown to spread through the air from a single cough, a single breath, or a few seconds of speaking. Exposure to the row in front and the row behind occurs within 30 seconds and extends to seven rows within minutes. The lower oxygen levels and prolonged sitting on long flights doesn’t just impair your immune system’s ability to fight infections, it also puts you at risk for deep vein thrombosis and pulmonary embolism. Together, these two conditions make up the third most common cardiovascular disease after heart attack and stroke. For persons who contract the conditions, they carry a high risk of death and permanent complications. Deep vein thrombosis is a condition in which a blood clot (thrombus) forms in one or more of the deep veins in your body, usually in your legs. Deep vein thrombosis can cause leg pain, but often occurs without any symptoms. Pulmonary embolism is a complication of deep vein thrombosis in which one or more arteries in your lungs becomes blocked by a blood clot that has traveled to your lungs from your leg. While these conditions are of most concern for people with chronic respiratory diseases, doctors who specialize in travel medicine and lung diseases have been trying to spread the word for years that all travelers need to take precautions to avoid venous thromboembolism. This involves avoiding excess alcohol and caffeine-containing drinks, remaining mobile, and exercising during the flight. For air travelers with a history of venous thromboembolism, obesity, heart disease, significant medical illness in previous six weeks, immobility, pregnancy, or estrogen therapy (hormone replacement therapy or combined oral contraceptive pill), experts advise that in addition to the above advice, travelers wear compression stockings, avoid sedatives, and avoid sleeping for prolonged periods in abnormal positions. They also recommend a preventive dose of blood thinning medication for those at high risk of clots, such as those who have recently had a stroke, major surgery, or trauma. Irrigate your nose (or your children’s) with a saline solution—both before and after the flight—by using a dropper or small squirt bottle. Nasal irrigation with a saline solution helps clean out at least some of the allergen, fungal, and viral pathogens from the nose and thus can help to reduce the risk of getting a sinus infection after flying. Keeping the nasal cavity moist in the dry atmosphere of an airplane cabin is also most beneficial. Drink lots of water throughout the flight. What do you do to keep from getting sick when you’re traveling by air? Please share the techniques you and your family have used to keep an air flight from making you sick. Have you tried nasal irrigation? What other tips have you tried? Infect Dis. (2007) 195 (5): 675-679. Aviat Space Environ Med. 2012 Apr;83(4):418-23. Evid Based Complement Alternat Med. 2012; 2012: 417267. Originally published in 2015, this post is regularly updated. alcohol, allergen, bacteria, blood clot, caffeine, cardiovascular, cardiovascular disease, children, common cold, deep vein thrombosis, dizziness, echinacea, elderberry, embolism, estrogen, estrogen therapy, flu, getting sick after flying, ginseng, health, heart attack, heart disease, herbal medicine, hormone, hormone replacement therapy, how to avoid catching a cold on a plane, immune system, infection, leg pain, lung diseases, motion sickness, natural immune boosters, natural therapies, obesity, pain, respiratory diseases, sick after flying, sinus, sinus infection, sinus infection after flying, stroke, supplement, supplements, thrombosis, white blood cells, your lungs. Another excellent way to avoid unhalation of airborne pathogenic microbes is to wear a surgical mask while in flight. Might look different, but it’s been 100% effective every time I fly. Correction to last comment: inhalation was misspelled. Sorry. Another factor is the lack of sleep that often accompanies air travel, as it can really weaken an individual’s immune system. It’s important to tackle jet lag right away and get good rest after the flight. Another thing to try is the use of breathing masks while on public transportation, as many asians do. I haven’t tried that myself though. One time I really pushed it and took an intercontinental flight after a night of heavy drinking. I was so weak that got a staph infection that started as a joint pain, which i assumed was due to poor posture on the long flight, but within a week I was in the hospital hooked up to IV antibiotics. Never again, give your body a break. A flight attendant told us her method of not getting sick was to put polysporin ointment into the nostrils. Our family has been doing this for years and it has worked for us. Worth a try. Wear a facemask! Better yet wear thebarriermethod.com. We are a new start up from Hawaii making fun and stylish masks. Bonus! Fabric is infused with essential oils. Please check us out! Insta&facebook. @thebarriermethod. Passengers aren’t allowed to bring water on board with them, and the Air Canada only gives you a half cup of water per flight. Albert, I’ve always been able to bring water on board, as long as I purchase it after going through security. Have you tried that? I couldn’t survive a flight without plenty of water! I fly often, and get bleeding sinuses each time. I have noticed that when I begin to cough and sneeze on a flight, many other passengers are also sneezing and coughing at the same time. I have begun to wonder whether the pilots introduce some chemical into the air at set times… perhaps to purify the air or some other reason? The co-incidence is too compelling to be random. Since I have started cleaning the tray table with disinfectant wipes I have not gotten sick, nor have my children. They are really quite dirty as evidenced by the used wipes. It is actually pretty gross. A quick wipe down of the arm rest and head rest help too. I am sitting here 7 days after a flight from the Dominican Republic to NYC and I have had a severe cold/cough for 6 straight days. A co-worker commented to me that I get sick every time I return from vacation. He is absolutely right. Shouldn’t the FAA pay more attention to this problem or are we to fend for ourselves. At least mnow I know what is happening and I can do something to protect myself. Thanks for all the good info.